Come Together Kids shared these Personalized Lunchboxes. What a great idea! 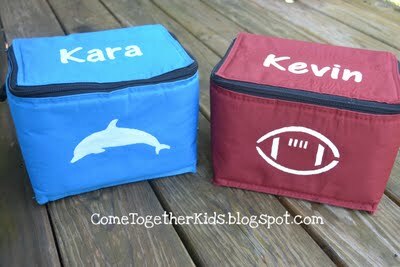 I have been trying to figure out how to personalize my kids' lunchboxes for months now, and this would be PERFECT! I have all the stuff to make a Freezer Paper T-shirts, so I will definitely be making these before school starts. The Blackberry Vine shared how to make these Back to School pencil treats from Rolos and Candy. YUMMY! What a fun gift this would be to put into your kids' lunchboxes on the first day of school. These are a sweet way to let your kids know your thinking of them when they are away. 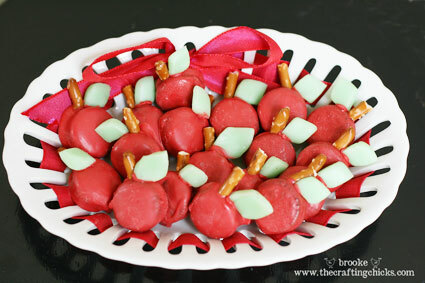 Wouldn't it be fun to make a special treat every day for the first week? LOVE IT! Skip To My Lou shared how to make these Mini Oreo Apples. Aren't these the cutest thing ever? These would be another great gift to add to lunchboxes. Or what about giving them as a teacher gift? These are so clever that you can use them for just about any School theme, gift, or party favor. 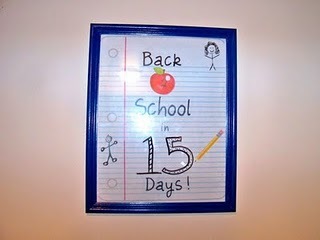 Confessions of a Stay Home Mommy shared this Back To School countdown printable. I am a HUGE fan of countdowns and have a "small" collection for holidays, but have never seen one this cute for Back to School. It looks like it's a notebook paper with doodles on it and I LOVE that. I can't wait to print this out and add it to my collection. Me and My Boys shared this Capri Sun bag. This would be a fun new bag for school papers, lunches, or notebooks! I know I have several items made from Capri Suns and would love to add this bag to my Tote collection. And I know with school coming up, I will have LOTS of these wrappers in lunchboxes!